Final: South Fort Myers 34, Gulf Coast 20. Wolfpack Class 7A-District 12 champs. Good evening everyone! Welcome to our live chat. Naples at Barron Collier, 7 p.m.
Community School at Southwest Florida Christian, 7 p.m.
First Baptist at Moore Haven, 7 p.m.
Palmetto Ridge at Golden Gate, 7 p.m.
Lely at Immokalee, 7 p.m.
Evangelical Christian at Marco Island Academy, 7 p.m.
Gulf Coast at South Fort Myers, 7:30 p.m.
Share your photos with us: Each week fans can submit their photos for a chance to win a large pizza & T-shirt from Il Primo Pizza and Wings. 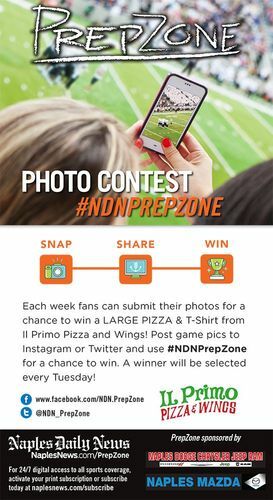 Post game pics to Instagram or Twitter and use #NDNPrepZone for a chance to win. A winner will be selected every Tuesday. What's happening everyone? Thanks for following the live chat. 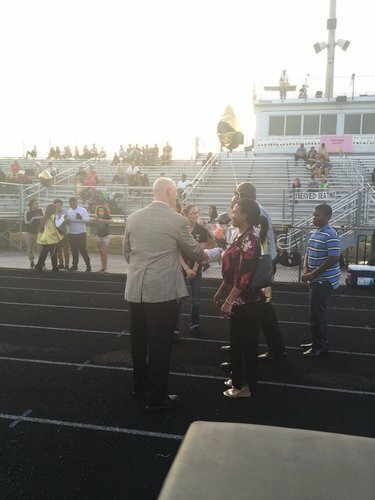 I'm at Lely-Immokalee, where winner will be district runner-up and make playoffs. Loser goes home. What's up Vonna? What costume are you wearing tonight? @AFisher: No costume. I will be wearing a purple wig tomorrow.